St. Patrick Parish is pleased to announce that we have partnered with myEoffering.com. This service will provide you with the convenience of online contribution. Online contribution refers to a process much like online bill pay, whereby parishioners and other donors opt to have their financial contributions to our parish withdrawn directly from their checking, or savings account, in lieu of bringing cash, or paper checks, or envelopes each Sunday. Vatican II has called us to full, active, and conscious participation in all aspects of the Mass. As a result, some people are reluctant to donate online because then they won’t have anything to put in the basket as it passes by. Aware of how important it is to fully participate in all aspects of the Mass, there will be laminated offering cards that you may place in the basket each weekend. The pew cards are available in each entryway. Many worry about the security of their financial data, especially with the headlines concerning identity theft. Rest assured that we chose myEoffering.com in part because of their strict security measures. They have passed all the required tests to be fully compliant with the Payment Card Industry Data Security Standards. This means that they are using the latest technologies available to protect against would-be data thieves. They have processed electronic donations for many churches in the United States and we feel comfortable in the security their service provides. myEoffering.com has designed a secure, web-based platform in which donors may privately and prayerfully make one-time or recurring donations. Prayerful consideration of giving to God first enables you to witness a powerful sense of stewardship. You can customize a completely individual method of giving, based on how and when you receive your income – whether it be bi-weekly, monthly, or semi-monthly. By setting up recurring donations to be automatically debited from your account, it allows the parish to better plan budgets and expenditures and provides a more accurate financial forecast. It also enables you to stay on the path of your contribution goals by ensuring that even if you are unable to attend church on a particular Sunday, you needn’t worry about remembering to make that contribution the following week. With more consistent stewardship, our parish is able to focus more on the ministry of God. 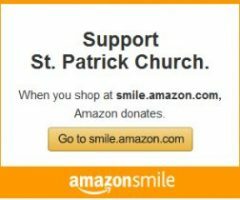 myEoffering.com also gives you more freedom in attending any parish on a given weekend because it assures you your weekly donation is going to your designated parish. No longer will you be concerned that your home parish is in fact receiving your weekly offering from an envelope deposited at the parish your visited. The first time at that site, you will go to the REGISTER tab on the far right and follow the prompts. Within minutes you will be prepared for giving your first online donation. When specifying the donation amount, you’ll see a box marked “suggested donation.” The suggested amount will be the value drawn from your account and deposited into the parish account. There is a box marked “Number of donations” – this option insures that you cannot sign up for an indefinite period of time. If your Donation Frequency is weekly and the Number of donations is 100 – then your online donations will stop after the 100th week (just shy of two years). Once you’ve exhausted the preselected "Number of donations", an email reminder will ask you to log into your account and reset the Number of donations to continue your online giving. Just as you receive separate envelopes for various collections (eg. 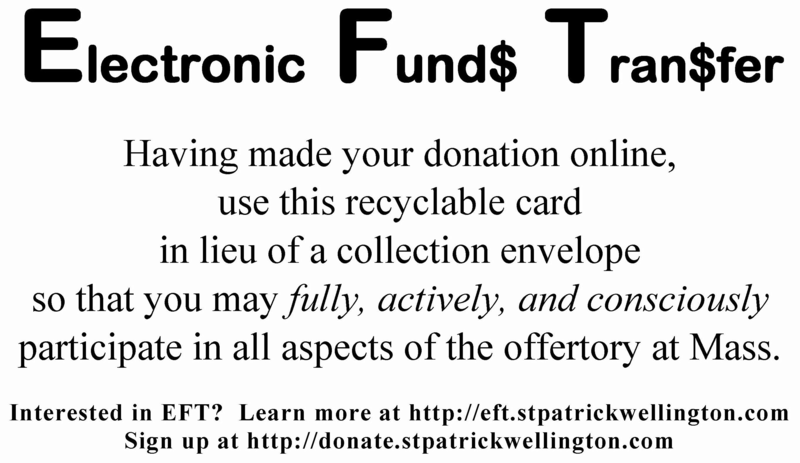 regular offertory, SPW Charitable Outreach, Christmas, etc) online giving can also accommodate these various offerings – but each one requires a separate authorization. Thus, to make a regular Sunday offering on a weekly basis, an outreach donation on a monthly basis, and a Christmas offering annually will require three separate authorizations. Before your account is debited, you will receive an email reminding you of an upcoming withdrawal. Once the donation has been received, you’ll get an email confirmation. 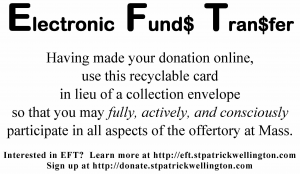 If any part of this process seems confusing, you are asked to call the parish office 440.647.4375 and ask to be contacted for assistance in clarifying or implementing your desired pattern of donations. Thank you for your consideration of this process. 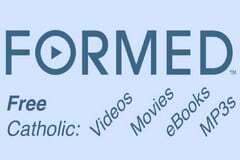 myEoffering, hopefully, will become an attractive and convenient alternative for you as a practicing devout catholic and parishioner of Sacred Heart Parish. Be assured as your Pastor I am grateful for your considerations in this option for providing tangible support of St. Patrick Parish.